Posted on September 4, 2014, updated August 26, 2014. If your fall schedule looks a little like ours, packed with weddings and events, then you are probably in need of some dress options. We all know that the bride is the star of the show, but let’s be honest, as a guest, you want to look your best, too! We love browsing all of the gorgeous cocktail dress and gown options out there and have pulled some of our favorites that would be perfect for a fall wedding. 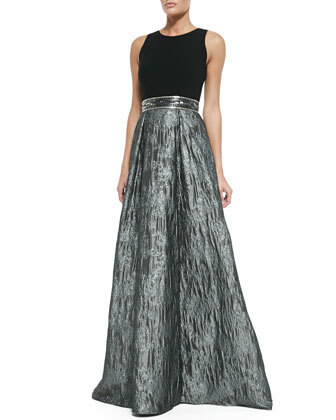 This Carmen Marc Valvo gown is classic on the top but has a stunning gray textured skirt on the bottom. It’s elegant with a twist. This is a great option for a Mother of the Bride. 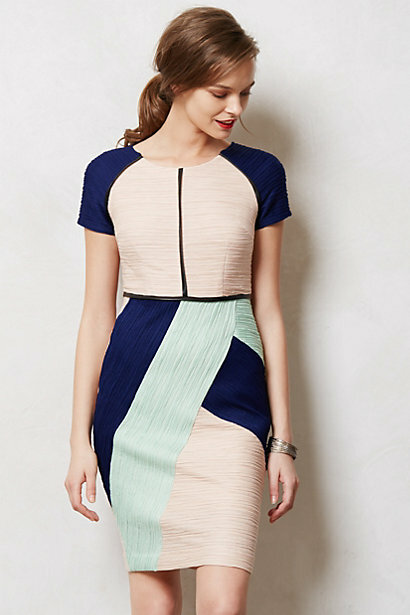 This strapless cocktail dress from Neiman Marcus has a youthful, flirty skirt. This is similar to the first gown, but great for a wedding or event that doesn’t require black tie. This little black dress by Valentino is a great option if you have many events coming up. You can re-wear this dress and completely switch up the look by adding different shoes and accessories. Not to mention, a little black dress like this always looks great with pearls and the perfect red lipstick! 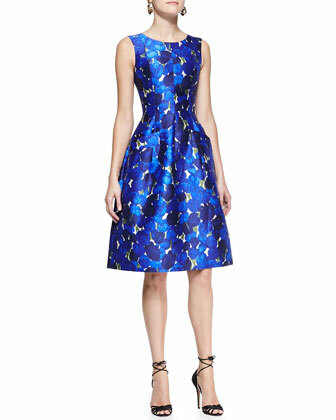 We love the mixtures of dark blue and bright blue on this Oscar de la Renta frock. This dress is classically cut with a full skirt, so it is flattering on most figures. Go with neutral accessories to really let the dress pop! 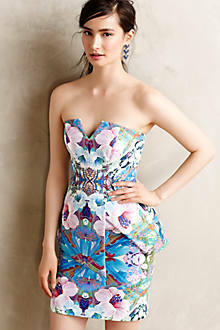 The colors and pattern on this dress are stunning, not to mention, the peplum detail around the waist is figure flattering. This would be great for an outdoor wedding– just make sure to remember a wrap or coat! This sheath style dress is a great option if you are looking for something with sleeves. Plus, the leather touches are on trend. How fabulous is the hot pink shade of this Halston Heritage number? Keep it simple with neutral shoes and accessories or play up the dress with fun shoes and bright jewelry! 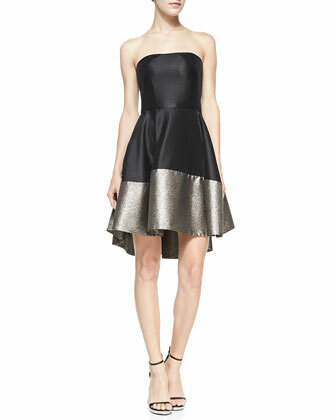 This metallic jacquard dress by Alice and Olivia would be great for ‘black tie optional’. You don’t have to wear a gown, but the fabric and metallic print give it an extra special touch. We hope you enjoy our finds as much as we enjoyed finding them!